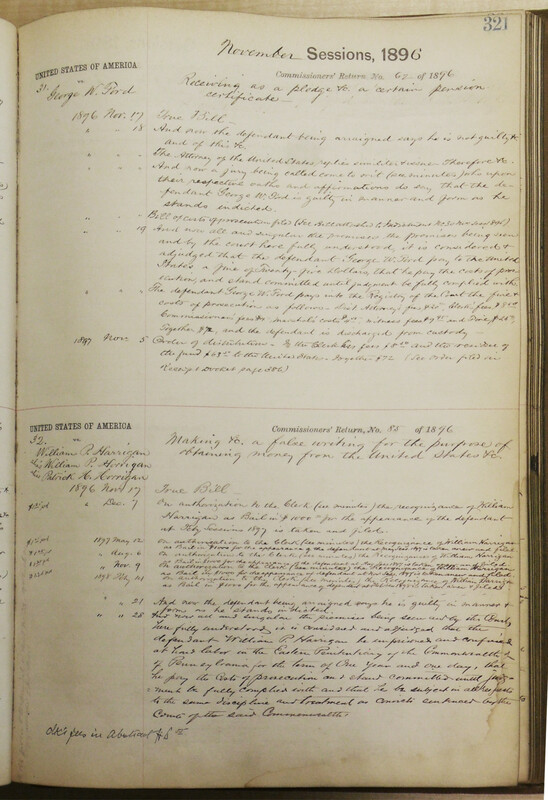 Vindicating an Ancestor: My Recent Visit to the National Archives of Philadelphia | Photo Restorations by Tim G.
The newspapers at FultonHistory.com have a way of busting my bubble. Just when I get to thinking about how clean all of my perfect ancestors’ hands were, along comes a FultonHistory.com article to sully them. I call it “The Bad News Report”. So far, the bad news has been that an ancestor of mine hit somebody with a car. To date, I believe the investigations have found no fault, but it’s still unfortunate to read. My most recent Fulton discovery turned up something a little more criminally culpable. 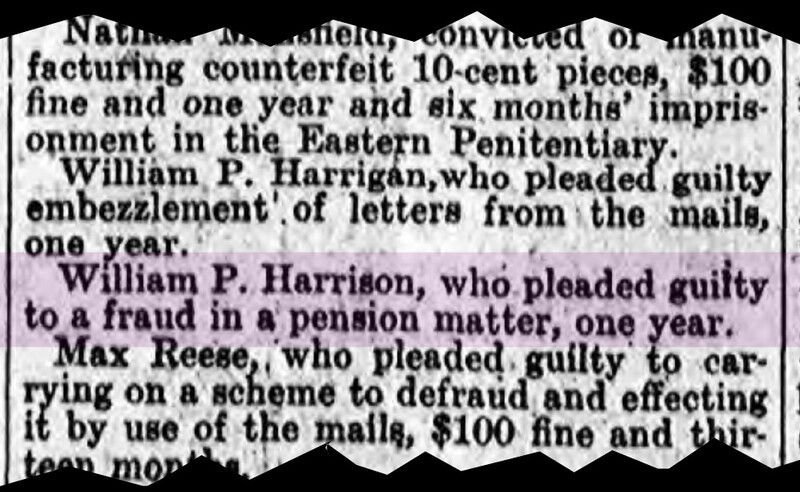 “William P. Harrison,” an article from the first day of March, 1898, stated, “pleaded guilty to a fraud in a pension matter,” and was sentenced to one year in prison by “Judge Butler”. My grandmother’s great-grandfather was named William P. Harrison, who served honorably in the Civil War before marrying his wife, Harriet, and fathering five children with her. He worked as a car inspector for the Pennsylvania Rail Road for most of his adult life. To the best of my knowledge, William was a model American citizen. I had seen his Civil War pension file at the National Archives at Washington, D.C., and it did not speak of any shenanigans. William Harrison was a common name in 19th century Philadelphia, but William P. Harrison was not. When I see William P. Harrison in the historical record, it’s usually a ringer. So what was this pension fraud case about? I had to investigate. The first step is to find the correct court. The article identified the court as “Uncle Sam’s District Court”, but that’s not quite specific enough to pinpoint the correct case file. I also needed to know to which district the article was referring. 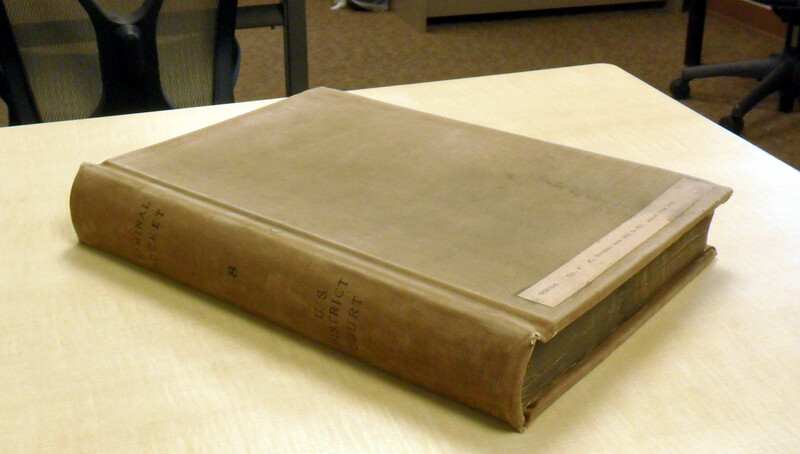 Some Googling revealed that a Judge William Butler presided over the United States District Court for the Eastern District of Pennsylvania in 1898. this was toward the end of his term. He would retire, in January of 1899, I would discover. Federal docket for Nov. 1892 to Aug. 1899. 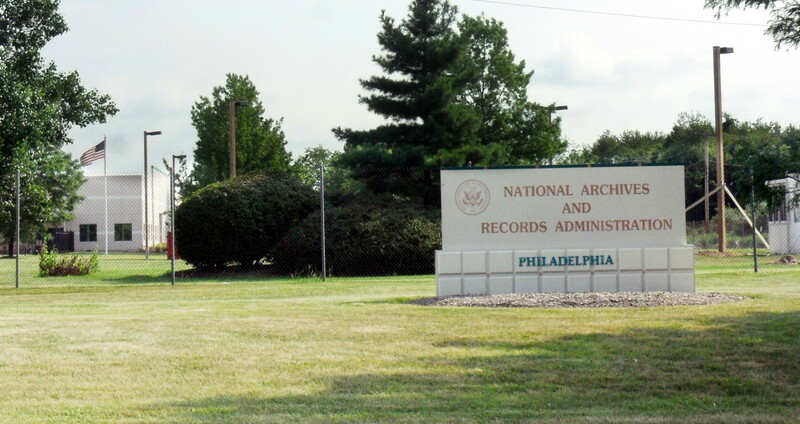 With this information, I called the National Archives of Philadelphia, where an archivist named Steven assisted with my request. He told me that he was unable to find a William P. Harrison in the federal docket books. Steven did, however, find a William P. Harrigan, who pleaded guilty to pension fraud. I requested to view the records, and Steven set them aside for me. [Said] writing was false in that it then and there represented among other things that he the said William P. Harrigan, alias William P. Horrigan, alias Patrick H. Horrigan was the identical William P. Horrigan, alias Patrick H. Horrigan, named in the pension certificate in his possession, No. 832,137, dated December 17th, 1892 and whose name is inscribed on the rolls of the United States Pension Agency, at the rate of Twelve Dollars per month. Whereas in truth and in fact, the said William P. Harrigan, alias William P. Horrigan, alias Patrick H. Horrigan was not the identical William P. Horrigan, alias Patrick H. Horrigan, named in the aforesaid pension certificate in his possession, No. 832,137, dated December 17th, 1892 and whose name is inscribed on the rolls of the United States Pension Agency, at the rate of Twelve Dollars per month, as he, the said William P. Harrigan, alias William P. Horrigan, alias Patrick H. Horrigan, at the time he so made, caused and procured to be made the aforesaid writing well knew the same to be false as aforesaid: contrary to the form of the Act of Congress in such case made and provided and against the peace and dignity of the United States. Basically, William P. Harrigan found someone with a similar name on the pension rolls and claimed to be him, whereas in truth and in fact, he was not. There was no mention of my ancestor, William P. Harrison, anywhere in the case file. He was not William P. Harrigan, nor was William P. Harrigan pretending to be him. As far as I can tell, the newspaper was simply incorrect for reasons that thus far defy explanation. I browsed the next issue for the newspaper for a correction, but I have so far found none. The stranger thing about the article is that it reported William P. Harrigan as having embezzled letters from the mails, whereas in truth and in fact, William P. Harrigan committed pension fraud. I still don’t k now who embezzled letters from the mails, but so long as my ancestor’s name did not appear in the docket book, his name has been cleared as far as I’m concerned. 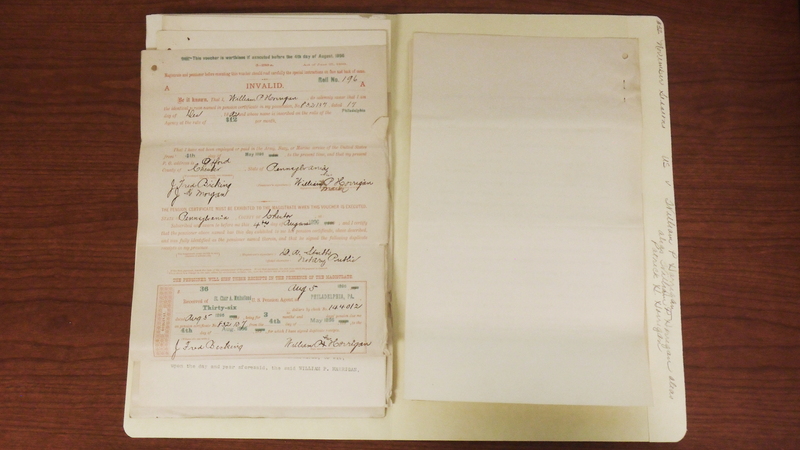 I photographed the records for future reference, even though they don’t pertain directly to any ancestor of mine. Since I’m so interested in testing inexpensive technologies, and since my usual handheld camera was then in ill repair, I photographed all of the documents with my Alcatel One-Touch Evolve 2 smartphone. This is one of the most affordable smartphones on the market today. Amazon.com and BestBuy are currently advertising them for around $50. I got mine for $40 factory refurbished from the T-Mobile store down the street from my home. The hardware is basic. Despite the absence of either a manual focus or a flash on the camera, I believe the results are usable for personal genealogy. When used together with Android apps like FamilySearch’s Memories, your research can practically organize itself. If cost has deterred you from joining the smartphone revolution, then I’d recommend jumping in with this phone or one similarly priced.